Sparkle and Shine: Pin a rose on your nose! "For beautiful eyes, look for the good in others; for beautiful lips, speak only words of kindness; and for poise, walk with the knowledge that you are never alone. " 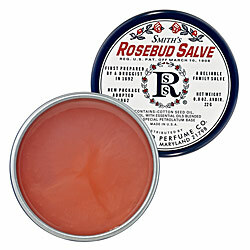 The next product I am going to review is Smith's Rosebud Salve. I had heard some people talking about this salve so when I saw it in Sephora I knew it was a sign that I needed this product. It comes in a really old-timey tin that reminds me of something you would see in like an old western general store or something. It is pretty cute though. The little container tells you that this product has a multitude of uses: chapped lips and skin, diaper rash, blemishes, detergent burns and rough cuticles. The only thing I actually use it for is my lips (and what the heck is a detergent burn.....?!?). I think they put all of those uses on there so they can call it a salve. I guess that is fancier than just lip balm. However since it was originally formulated in 1892 maybe they know something I don't. Regardless of all that, this is a superb lip balm.I use it every night before I go to bed and when I wake up my lips are perfectly conditioned. It stays on for a long time and it feels so good. I have said about a billion times how picky I am about what I put on my lips because they are so sensitive, but this did not irritate my lips at all. On top of all that I am completely in love with the way it smells. It definitely smells like roses but it is a little sweeter and less flowery than most rose scents. It is not so in your face that you can walk around smelling the stuff on your lips all day. In the pot it has a nice pink color but on your lips it ends up colorless. All in all a very very good lip balm. It will run you about seven dollars at Sephora. Cccheck it out.